Discover a more collaborative, real-time way to manage marketing campaigns. Planning your social media content and measuring its effectiveness can help ensure the success of your marketing campaigns, keep writers and other content stakeholders accountable, and provide clear communication between teams - not to mention organizing your publishing schedule and saving time. 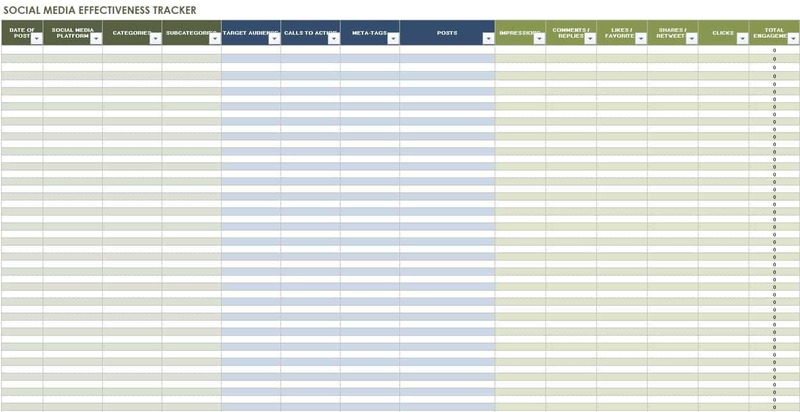 Below you’ll find a collection of free social media templates, including templates for strategy and planning, content calendars, influencer marketing, plus auditing and reporting. All of these free templates are in Microsoft Excel format and can be edited for your needs. 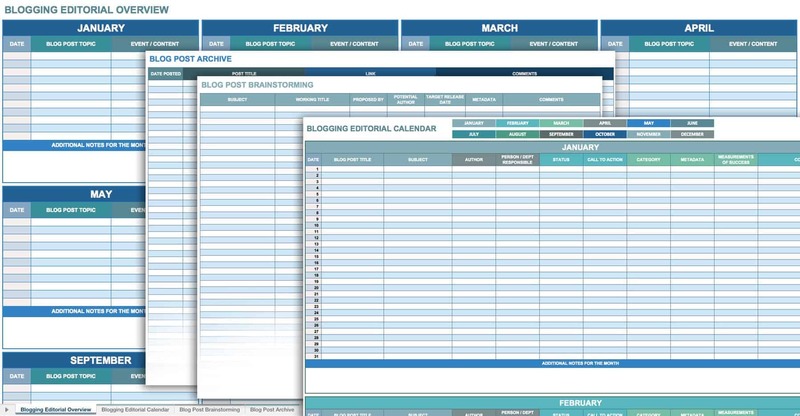 We've also included customizable templates in Smartsheet, a real-time work execution platform that empowers you to better plan, manage, and report on social media campaigns. Now that you’ve got your audience and social networks figured out, what are you going to share? You’ll need to determine your key messaging that both fits with your brand and distinguishes you from competitors. Keep this messaging in mind as you create social media profiles that reflect your brand, and make sure your profile images are sized appropriately for each network. Profile images offer customers a first impression of your business and should be consistent with your brand. Once you’re clear on brand messaging, you can narrow your focus to planning specific content. This may include campaigns around product launches or events, but nobody wants to be overwhelmed with promotional content - so make sure you are offering your audience real value and that you have a balance between promotional and other content. You also want a variety of content, including images and video, and to post regularly. The key word in social media is “social,” so create an engaging presence by encouraging conversation, replying to comments, and providing quality customer service. Twitter - Use Twitter for offering business tips and establishing yourself as an expert. Since Twitter limits posts to 140 characters, it’s perfect for cycling (and recycling) brief news updates throughout the day. But you’re not limited to text - try tweeting images to grab attention, and encourage retweets. Aim for several tweets per day, and afternoon work breaks or early evening commute times may reach more Twitter users. Facebook - Keep your Facebook posts brief and entertaining to encourage sharing and audience engagement. Use images and videos to capture attention and give personality to your online presence. Facebook is great for reaching a wide audience, but the focus tends to be more community oriented and less about business insights. It’s generally recommended to post on Facebook once per day, a few days per week. LinkedIn - Use LinkedIn to share industry news and build professional relationships. Sharing articles that are actually helpful and not just promotional matters here, but it’s still important to include images and videos in your content. Since LinkedIn is geared toward professionals, posting on weekday mornings or evenings may garner better results. Pinterest - Visuals are key on Pinterest. The majority of Pinterest users are women, and content is often DIY oriented. If this isn’t your audience, or your business messaging doesn’t translate well into strong visual content, Pinterest may not be the best choice. Top posting times will typically be on weekends. Google+ - In your public circle on Google+ you can share business info similar to what you would share on LinkedIn- think instructional videos and informative blog posts. Aim to post once per day, a few days per week, mid-morning to early afternoon on weekdays. Instagram - Another network for sharing visual content, Instagram is primarily used as a mobile app, so users may be accessing it many different times throughout the day, but early mornings may be best for reaching a wide audience. Consider ways to maximize your visual marketing, such as offering a giveaway that encourages followers to repost your content. Identify and track key influencers so that you can develop relationships with them. Influencer tracking can help you extend your reach to broader audiences by, for instance, working with a blogger who has a large, loyal following. This template can help you vet potential influencers to make sure they’re a good fit for your brand and objectives. Maintaining a list can also provide future outreach options - but you should build relationships with influencers before you actually engage them for a specific marketing campaign. 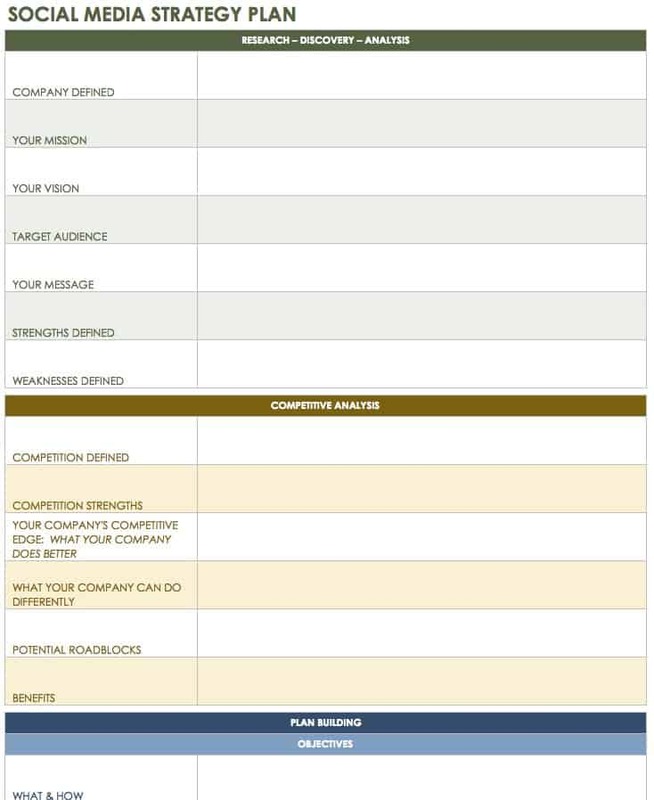 Use this template to document the results of analyzing any content or engagement related to your business or topics. By listening in on the activity on your social networks, you can learn more about your target audience - the type of content they are sharing, what content generates the most engagement, when posts are being shared, etc. - and who your influencers or competitors might be. 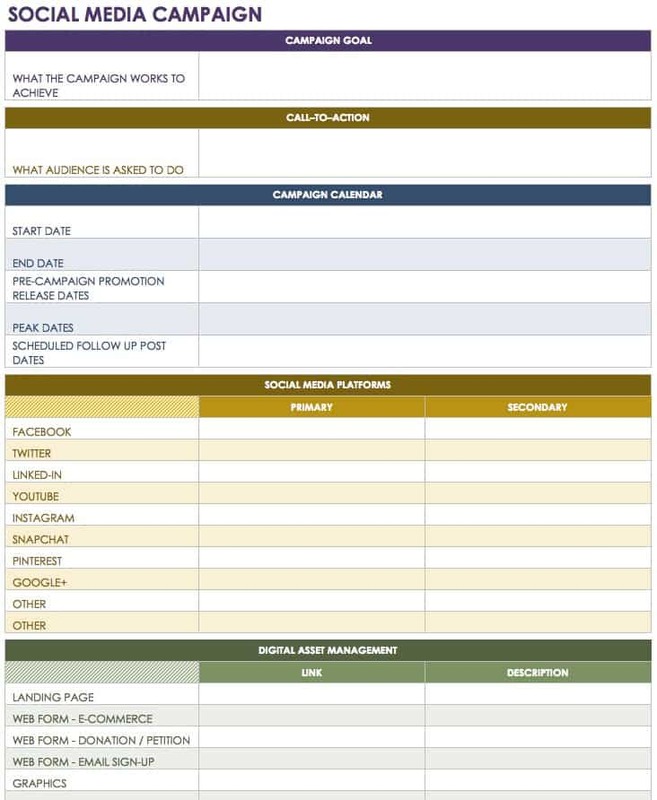 This template is designed to help you analyze your social media posts for a deeper understanding of what is working and why. 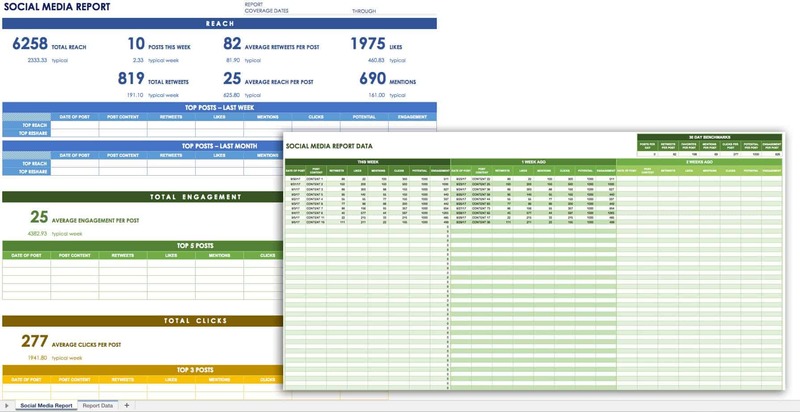 Once you have all your data entered - and some social networks offer export features to speed up this process - filter the spreadsheet columns to analyze your posts based on different metrics. Getting a better sense of why certain posts are more successful can help you tailor your content for different social media platforms. Creating a strong social media marketing plan is important in order to execute on your marketing initiatives. But it’s only one factor that impacts success. 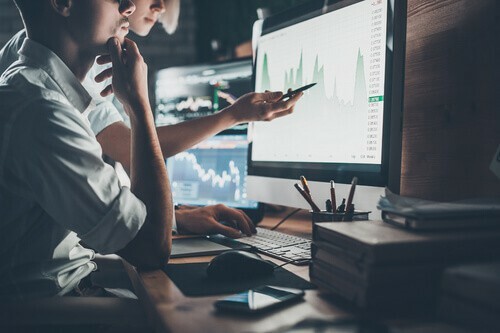 To ensure your campaigns meet their objectives, consider using a tool that allows you to visualize your marketing efforts on an interactive timeline, organize and manage campaign-specific details in one location, and track campaign progress, all in real time. Try Smartsheet to discover how you can maximize your marketing efforts, today. 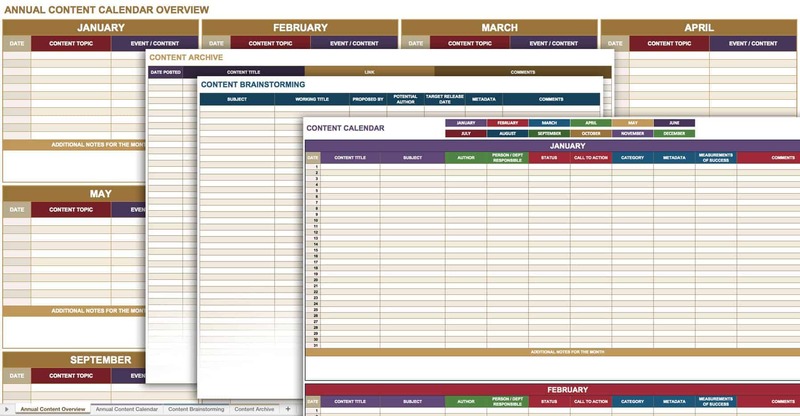 Content calendars are strategic resources used by marketing teams to plan, track, and share content marketing activity. 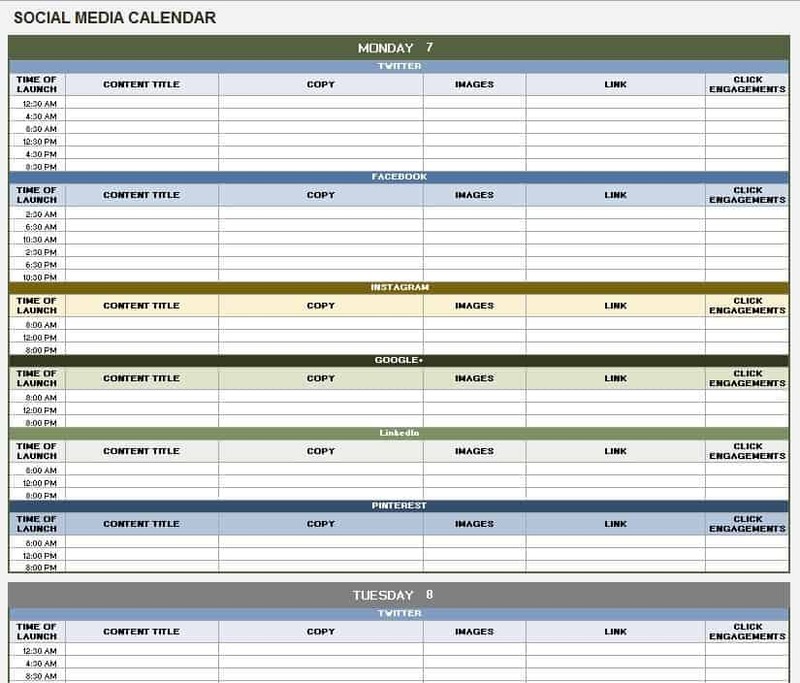 The calendar format gives a visual look at content and campaign launch dates. 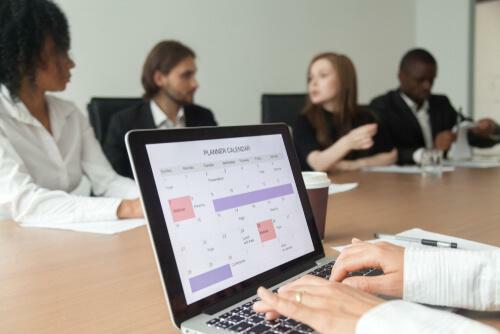 As compared to a simple list of content, a calendar view offers better visibility into the specific pieces of content, when they are published, and who is responsible for what pieces of content. Evergreen content is a type of content that is always considered relevant, never becomes dated, and reports on topics that are of importance to an audience. Named after the evergreen tree, which retains its green leaves all year long, evergreen content never loses its significance. Need a marketing budget plan? 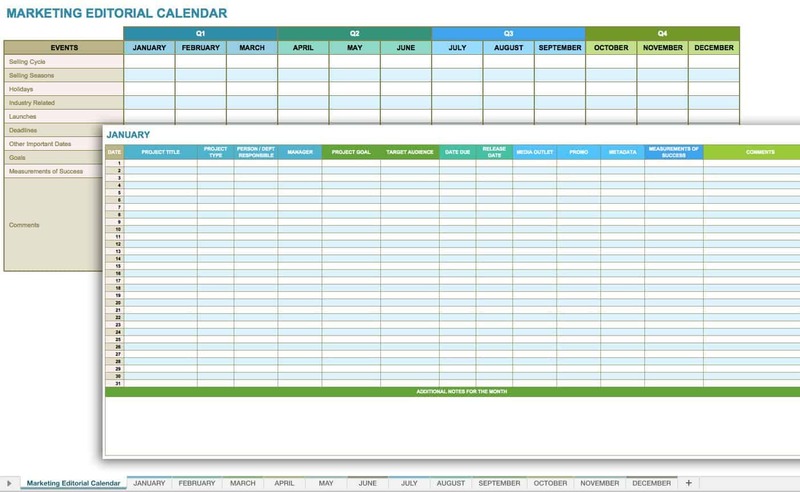 Choose from 12 free Excel budget templates.